On the western shore of Lake Michigan lies Manitowoc, a community of roughly 35,000 and rich in maritime history. Manitowoc is the lone Wisconsin port for the S.S. Badger carferry, which sails across Lake Michigan from Ludington, Michigan every May-October. Manitowoc was ranked #2 by Forbes Magazine for "Best Small Cities to Raise a Family." Congratulations to the S.S. Badger on its status as a National Historic Landmark! Click here to read more about the history of this great ship. Manitowoc was officially founded in 1836 with shipbuilding playing a major role in its growth. Sailing ships, schooners, clippers, and various other pleasure crafts were manufactured in Manitowoc, and even today it is known for its luxury yachts. The early Native Americans referred to Manitowoc as "Home of the Good Spirit" because of its beautiful rivers and harbors. The Rahr-West Art Museum was named by USA Today as one of the "Top 10 Great Places to See Art in Smaller Cities." It is housed inside a historic Victorian mansion, and delights visitors with work by such masters as Picasso and Warhol. It's definitely a "must-see" when visiting Manitowoc. The Wisconsin Maritime Museum takes you into a world of ships and anything relating to life on the Great Lakes. See an authentic WWII submarine, visit a model ship gallery, and try a sport fishing simulator. The exhibits and programs at the museum are entertaining and educational for all. The Mariners Trail bike and foot path is a wonderful seven mile trail running along the shore of beautiful Lake Michigan, connecting the cities of Manitowoc and Two Rivers Wisconsin. Thousands of people use the Mariners Trail for biking, in-line skating, running or walking along its smooth asphalt surface. The Trail is free to all its users and is a wonderful place to spend the afternoon no matter what time of year. 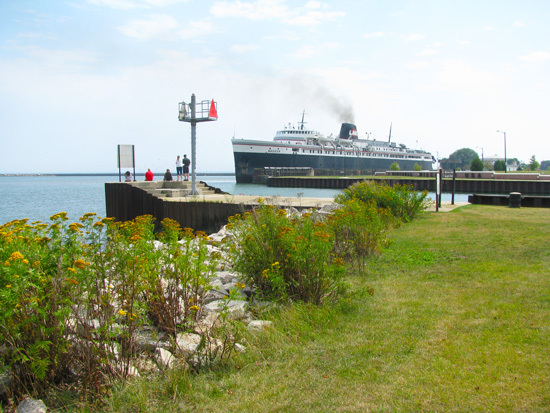 Crossing Lake Michigan every May-October, the historic S.S. Badger carferry is a beloved and familiar sight to both the Ludington and Manitowoc communities. This 410' ship carries up to 620 passengers and 180 cars, tour buses, RVs, and semi-trucks. It takes four hours to cross the lake, and with all the amenities there are on board the ship, the trip is enjoyable and relaxing for people of all ages. Check out the Manitowoc/Two Rivers Calendar of Events for an overview of annual festivals. Visit DestinationManitowoc.com, Manitowoc.org or Manitowoc Chamber of Commerce or Manitowoc Area Visitor & Convention Bureau for more information about Manitowoc. It's a very short drive between the many charming communities in our area. Heading north along the lakeshore on the Lake Michigan Circle Tour, be sure to visit Two Rivers, Kewaunee, Algoma, Door County, and Green Bay. Our Manitowoc visitors business sections include information for Camping, Restaurants, Shopping, Things to Do, Lodging, and more.